Hello. We are Linda Gao and Luke Mao, Owners / Centre-Directors of Mathnasium of Cambridge, your neighbourhood math-only learning centre. We help kids in grades 1 to 12 understand math by teaching the way that makes sense to them. 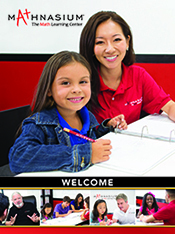 We are a math learning centre serving grades 1 to 12 students in Cambridge area. We are located in the shopping center at the intersection of Dundas St N and McLaren Ave, and right beside Shoppers Drug Mart. We offer year-round math instruction in elementary math, middle school math and high school algebra, geometry, trigonometry & calculus as well as private math tutoring and math homework help and test prep. Call today at (519) 623-6668 or email at cambridge@mathnasium to book your FREE Assessment and see how we can help! Mathnasium staff are very dedicated and passionate about math and really teaching the kids that math is fun once you get the concept! My son feels very welcome going into the centre. The staff are all great! My son has gained a lot of knowledge and is much more confident at school. Thank you to all the great staff. I am seeing great results from my children in the areas of math as well as the ability to focus on learning in general. This has made a direct impact on my children's math grades at school and with their other classes. My children's confidence, problem solving and mental math skills have improved dramatically. At Cambridge Mathnasium, the instructors are very positive and very capable in their math skills as well as their ability to teach children. They also have great methods to encourage learning while providing attainable, measurable goals. The process of a typical class is beneficial due to the initial tutoring aspect to direct the student followed by some independent learning with the student's focus on the task, with quick guidance, tutoring and feedback a simple request away. The end of the class provides the tutor the time to provide more feedback to the student and to allow for analysis from the student on what they learned, what they need to work on, and what is next for them to learn. They also have a fun way to reward the student's gains. I appreciate the flexible hours that suit my schedule and the fact that all of the material that my children need remains at Mathnasium, so that there is nothing to do at home and nothing to bring to the class. My daughter seems to be more positive about her approach to mathematics. I’ve only been going to Mathnasium for a few weeks but I’ve noticed drastic improvements in my ability to grasp concepts and do mental math. The worksheets are catered to each students needs and they help you strengthen your building blocks in math. It’s astonishing how many times a problem you are having now can be solved by going back and looking at the basics. I’ve had a great experience with the tutors, as they bring their own techniques and methods into perspective as well which really helps you expand on your thinking. So far our daughter is really enjoying going. We are seeing improvements in her grades already. My only wish would be that you were open later on Saturday so that she could go three times a week. My daughter enjoys going as the current curriculum in grade seven is not challenging enough for her. Mathnasium gives her more difficult tasks and helps keep her ahead of the curve. Your concept of math-only has greatly helped my daughters. I also like how your plan looks at the core-based math knowledge. Thank you. My son is very happy and rediscovered his passion for math. He is getting the right amount of repetition and enjoys the focus what he doesn’t know. Good rewards and atmosphere. He is very motivated and likes the staff. My daughters attend Mathnasium three times per week and are actually excited to go! I see the progress that they are making and their confidence in math improving. Your approach to teaching math has made a positive impact on my daughters. Thanks Mathnasium! You provide great feedback for the parents as well as helpful incentives for the children to perform better. The math levels seem well planned out in terms of a natural progression with enough difficulty to challenge them but also enough comfort so as not to discourage them from growing. The instructors are very positive and seem to be able to help and guide the students just enough so that they can become more independent. I also love the flexibility of class times. My son is feeling more confident and extremely happy about his performance at school. Great staff and great teaching and improved marks for my kids and getting ahead of their grade for sure! We continue to have a great experience at the Cambridge location. The instructors are very helpful and patient with my son. They always encourage students and parents to be engaged and connected with the program. It is certainly making a difference. I would highly recommend your services to others. My daughter loves mathnasium, she is more confident in her work and her knowledge is expanding! My son has benefited greatly from attending Mathnasium. All of his teachers have been extremely patient and helpful. The owners of the company are extremely accommodating and caring. My child has thrived at Mathnasium. Her increased confidence in math from her new learned foundations are wonderful to see. Special thank you to Luke for continued support and encouragement. I would also like to thank all the instructors at Mathnasium for giving my child the tools to finally succeed in math, not just for an exam but for life. My son understands math now thanks to you. He is more confident and is eager to learn and keep learning ! Mathnasium makes math FUN ! Thank you !!! My son is steadily gaining confidence in his ability to do math. This is the first time he has felt good about himself doing math. He is actually beginning to enjoy his time doing math. Thank you for everything so far. My daughter loves to go twice a week. She feels more confident since starting the program. Great approach with the kids. Personalized materials and friend teachers! My daughter Diana first came to the centre with very low self confidence, and had fallen behind at school. The team at Mathnasium has helped her so much and brought her confidence back up. She is now excited to go to Mathnasium and is doing better in school. Amazing team at the Cambridge location. The one on one time really helps her focus and gives her the extra time and attention she needs to properly understand the lesson at hand. Very pleased. Thank you Mathnasium team if Cambridge. Michele and Diana.